This is a healthy rice dish that tasted so delicious. The good thing about flax is that it doesn’t have any smell, so that we can easily sneak it in most dishes. That way we can get good health benefits too. As we all know, flax seeds are so rich in omega-3 fatty acids which help to strengthen bones and protect from heart disease, cancer and diabetes. Heat oil in a pan and add mustard seeds. When they splutter add cumin seeds + onions and sauté well until onions become soft. Then add green peas + flax powder + cloves + ginger-garlic paste + coconut powder + oil + garam masala + black pepper powder + cashews and sauté well. Finally add cooked rice and mix well with a spatula until it blends well with the masalas. Adjust salt. Cover and leave on low flame for 5 minutes. Later mix well and transfer to a serving bowl. 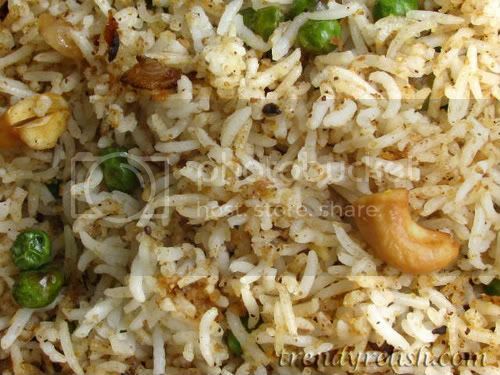 Enjoy this yummy and healthy rice with some curds and papads. So very sneaky! I love flax and it's popping up everywhere these days. Great idea. This is very innovative of you, dear.. And that really is a healthy rice dish. Wow! Innovative and healthy rice!! Very Nice Looking Flax Rice. Loved the wonderful clicks of yours. Wow looks very tempting.. Never tried anything with Flax seeds till now! I usually add some falxseeds to the idli podi or other podis. Will try with rice soon. Very unique and healthy rice.. I love Flax seeds powder too, use it to add to Parathas etc. Rice with Flax looks fabulous. Innovative and healthy dish..looks great. Sounds very healthy rice dish dear.. Delicious and innovative recipe! lovely clicks! Reg: heating/cooking flax seed: With normal cooking time there will be only a minimal effect on the omega-3 fats. In the recipe I didn't roast it for a prolonged time before adding rice. So I believe (and read) that no way the nutrients are lost if we cook/heat flaxseeds at normal cooking temperatures. Well said about the loss of nutrients. It is well know that a prolonged heating will make the nutrients loss but not the way you did. Your recipe looks really tempting and innovative. I tried onetime Upma with flax seeds powder and it is a big failure as it was so sticky. but your dish really looks good. Wish to have the taste of it. Amazing recipes and stories ....I added you to my blogroll as well! Hi Uma ..visiting your blog for the first time.Flax masala rice seems to be an interesting dish ...never knew how to use flax seeds.will surely try out this one. I shall add urs too.